New Big W Agreement voted up! Following a ballot of Big W employees, an overwhelming majority voted yes in favour of the proposed Big W Agreement. 69% of eligible Big W employees voted in the ballot with a 92% yes vote! The proposed Big W Agreement will now go to the Fair Work Commission (FWC) for approval. The new Agreement will commence from 6 May 2019 or 7 days after approval by the Fair Work Commission, whichever is later. 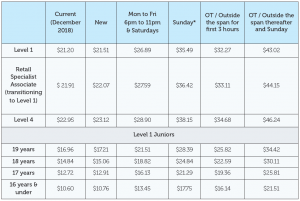 The first pay rise and increase to casual loading to 25% will apply from 6 May 2019 regardless of whether the Agreement has been approved by the FWC by then. The SDA worked hard throughout negotiations to ensure you receive fair pay and working conditions. Thank you for voting to have your say and to protect and improve your pay and conditions at work. We will keep you updated as this process progresses. Below is the current hourly rate of pay and the proposed new hourly rates of pay for team members. * Based on approval of new Agreement post 1 July 2019. The SDA has worked hard to ensure your take-home pay is protected and to secure wage increases. Team members received wage increases in December 2018 and will receive a further increase in May 2019.
in the Annual Wage Review (AWR) in July each year. *The new Agreement will contain a guarantee that base rates of pay for Level 1 employees are at least 4 cents above the Retail Award at all times. If the Annual Wage Review is above 3.31% in July 2019 this will come into effect. Any worker on a higher or saved rate will receive 50% of each wage increase until their new rate aligns. an evening penalty rate for casuals which will apply in the new Agreement. As a result of winning our case in the Fair Work Commission, casual penalty rates will increase over the life of the Agreement for work on Monday to Friday 6pm-11pm and on Saturdays. The proposed Agreement mirrors the penalty rates in the Award which includes the Fair Work Commission decision to reduce Sunday penalty rates over the next 2 years. However, there is a mirroring clause in the Agreement to ensure Sunday penalty rates will move in line with the Award up or down. There is currently proposed legislation to increase Sunday penalty rates in the Award. 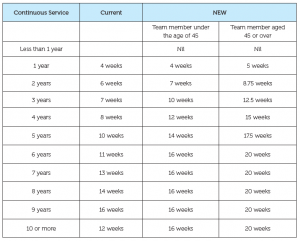 There are several improvements to rostering protections in the new Agreement. • Changes to rosters must be in writing before they occur and you must be consulted about any changes to your roster. • Big W must provide 7 days notice of a proposed roster change. • If you disagree with your roster change you have 14 days to dispute it and can refer roster disputes to the Fair Work Commission. • Part-time additional hours: The proposed Agreement allows part-time employees to do additional hours. Additional hours must be agreed in writing and will now be paid at the appropriate rate of pay for the time worked. You can agree to do additional hours in advance by entering into a standing consent. You will now accrue additional leave entitlements including annual leave and personal leave. This is instead of the 15% loading. • Increase in core hours for part-timers: a new clause for part-timers to increase their base hours to their average over the previous 12 months. • Part-time conversion to full time: 36 hour per week part-time employees are able to convert to full time. The new Agreement has a new span of hours in line with the Award. In the new Agreement work outside of the span of hours will be overtime unless the Company and team member agree to have the hours treated as ordinary and earn the overtime as a penalty rate instead. * Big W maintain that Big W branded clothing is not a uniform and is voluntary. The special clothing allowance is only paid if you are required to wear special clothing. The proposed Agreement has a new classification structure. A higher duties allowance will be introduced so work at a higher grade for less than 2 hours will be paid for the time so worked and work for 2 hours or more will be paid for the whole shift. Leading Retail Associates will transition to Level 4. Specialist Associates will transition to Level 1 unless higher duties are applicable. The new Agreement includes significant improvements to redundancy payments. The new proposed Agreement contains a clause that may provide an employee faced with redundancy with the option instead, where available, of ongoing work and a partial redundancy payment. Redundancies in Big W, whilst rare, do occur. As an alternative to a full redundancy and leaving Big W employment an employee may accept a transfer to lower paid duties. In this case the proposed Agreement provides that Big W may, at its discretion accept this and make a partial redundancy payment. This payment is an amount equal to the difference between the employee’s former ordinary time rate of pay and the new lower ordinary time rates of pay for (i) the period of notice and (ii) for a period equal to the number of weeks’ severance pay that the team member would have been entitled to if their employment had been terminated. The SDA is able to assist a member with any issues around a proposed redundancy. Under the current Agreement, a part-time employee can have their core hours reduced by up to 20% per year, subject to certain criteria. The proposed new Agreement does not contain this provision. This means that without the employee’s consent, a part-time employee’s core (or contracted) hours can no longer be reduced. Any part-time team member who has previously had their contracted hours reduced retains the right to preference for additional hours that become available. • Consider your response about the impact of the change. Any disputes about a change to your roster should still be raised under the Agreement’s Disputes Procedure. Many part-time team members currently do flex up additional hours in addition to their core contracted hours. The proposed Agreement continues to allow part-time employees to do flex up additional hours if they wish. Under the proposed Agreement if a part-time employee accepts flex up additional hours they will have to provide written consent before they can work the additional hours. You can provide a standing written consent to do flex up additional hours based on your availability or you can agree in writing each time. You can revoke any standing written consent at any time. Any flex up additional hours a part-time team member agrees in writing to do are paid at the appropriate ordinary rate of pay, including any penalty rates or TTR. These hours are included in the calculation of an employee’s leave accruals, instead of the current 15% loading. They also go towards your average hours worked for the year. A part-time employee doing flex up additional hours cannot be rostered to a work a total number of hours (contract hours and additional hours) in excess of 144 hours in any 4 week cycle, without the payment of overtime. If you do not agree in writing to work additional part-time hours as flex up the additional hours are paid as overtime and do not accrue superannuation or leave entitlements. Part-time team members will have preference to additional hours before they are offered to a casual employee. The proposed Agreement provides the ability for a casual to request to convert to permanent employment, subject to certain criteria being met. This entitlement has been secured as a result of a case run by the SDA/ACTU in the Fair Work Commission. To be eligible, the casual employee has to have worked regularly for at least 12 months. If they have regularly worked more than 10 hours per week, they can request to be made a part-time employee. All requests must be in writing. 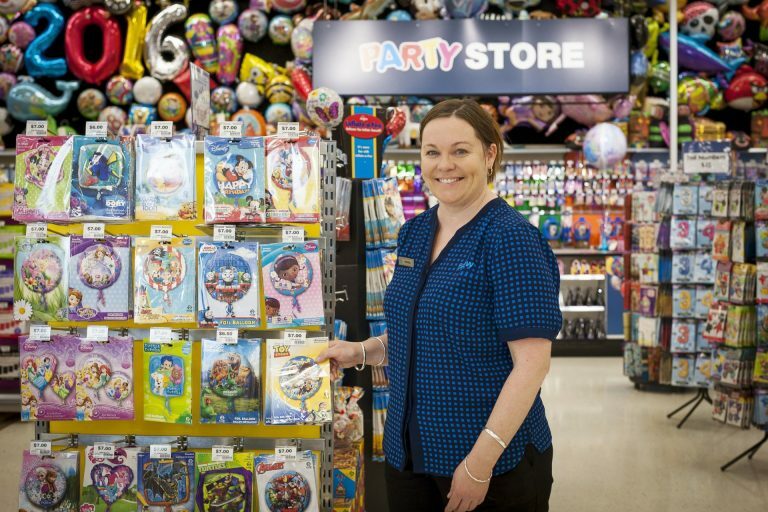 Big W can only refuse a request of a casual employee to become permanent on reasonable grounds after consultation with the team member making the request. If Big W refuse the request they must provide their reasons for this in writing to the team member. The SDA is available to assist any SDA member who is casual and wants to request to convert to permanent employment. The proposed Agreement now has a stronger dispute resolution clause. The new clause provides that if the dispute cannot be resolved either at the workplace or by conciliation at the Fair Work Commission, then the dispute can be referred to the Fair Work Commission for hearing at arbitration. Arbitration allows the Fair Work Commission to make a binding decision on how to resolve the dispute that Big W and the team member must abide by. The proposed Agreement provides for 5 paid days and 5 unpaid days of Family and Domestic Violence Leave (DVL). This is significantly better than the entitlement to only unpaid Domestic Violence Leave in the general Award. The inclusion of paid DVL recognises that team members who experience family and domestic violence may need additional support to deal with the impact of the family and domestic violence, particularly to make arrangements for their safety and the safety of others, attend medical appointments, court appointments, access police services and related activities which are impractical for a team member to deal with outside of their ordinary hours of work. The proposed Agreement provides a detailed clause on how to access this leave and important commitments of confidentiality from Big W towards team members accessing this leave. Team members engaged for 2 hours or less during 1 day or shift on duties paying a higher rate than their ordinary classification will be paid the higher rate for the time they worked on those duties only. Team members engaged for more than 2 hours during 1 day or shift on duties paying a higher rate than their ordinary classification are to be paid the higher rate for the whole day or shift. The proposed Agreement will not have split shifts, which previously permitted two shifts to be worked on one day with less than a ten hour break between shifts. Now there will have to be a 12 hour break (or 10 hours by agreement) between finishing one shift and starting the next shift. That means that the previous practice in some stores of using split shifts is no longer permitted. The proposed Agreement will not have delayed starts. Previously where a delivery was delayed and there was no meaningful work that could be done in the store then Big W could delay the start of a fill shift by up to 2 hours. This provision will not be in the proposed Agreement. The new proposed Agreement no longer contains the provision for a day in lieu when your nonworking day falls on a public holiday. The SDA fought hard to win this provision in the Award – which would have secured it for Big W workers. However, the case was not successful and as a result of this we have not been able to retain this benefit in the proposed Agreement. The proposed Agreement provides that Personal Leave will now accrue on a progressive basis. Currently an employees entire year’s worth of Personal Leave accrues on their anniversary date of employment. The change will mean that an employee will have access to Personal Leave that has already accrued and access to more Personal Leave as it accrues on a progressive basis throughout the year. SDA NSW Union Picnic Day is a hard won SDA condition that only exists in SDA negotiated Agreements and is an extra day off for retail workers. SDA NSW Union Picnic Day has been won again in the proposed Agreement and maintains the benefit of SDA NSW Union Picnic Day for the entire Agreement. SDA NSW Union Picnic Day is the first Tuesday in November. Work on the day is voluntary. Permanent team members who volunteer to work on the day receive another day off (TOIL) within 28 days. 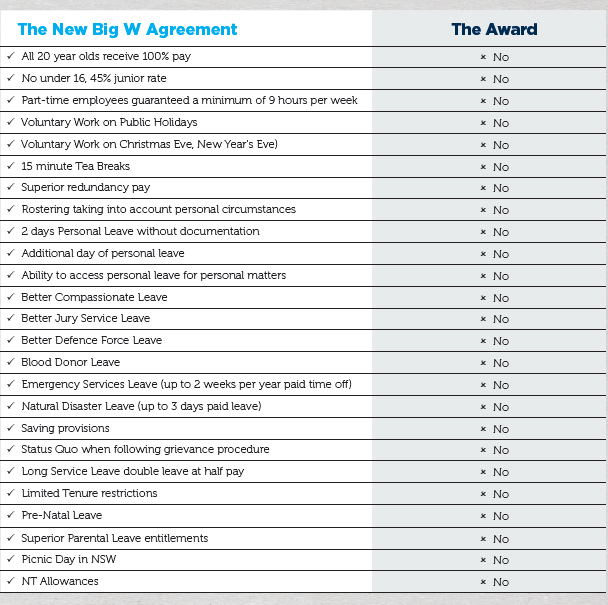 The proposed SDA-negotiated Big W Agreement will ensure you are better off than the General Retail Industry Award. Without it, many of the hard-won union conditions secured by the SDA could be lost. For a full comparison for the proposed Agreement and the Award, click here. If you have any questions or concerns please speaks to your SDA Delegates or Shop Steward or SDA Organiser or contact your local SDA branch. Click here to read the full proposed Big W Stores Agreement 2019.